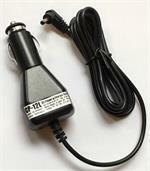 BP-196 : 9.6 volt 2000mAh EXTRA LONG LIFE rechargeable Ni-MH battery pack for ICOM radios. Includes Belt Clip. Replaces original BP-195 or BP-196. 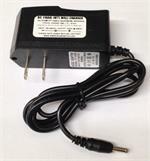 Fits radios such as the ICOM IC-A4, IC-T2A, IC-T2E, IC-T2H, IC-F3, IC-F3S, IC-F4, IC-F4S, etc. (all worldwide versions). 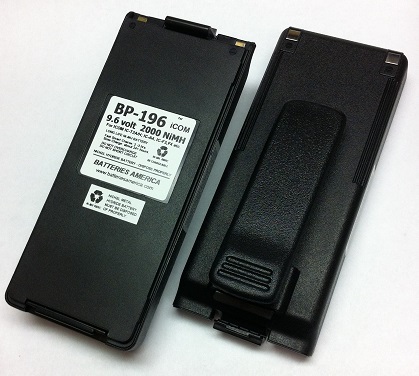 Provides more operating time while physically remaining the same size as the original OEM battery. Recharges either with a Desktop charger (ICOM unit or our EMS-196), or through the radio (with stock ICOM Wall Charger, or our WC-AIC, or BC-110AR); or with a DC Power & Charge Cord, like the CP-12L. Pricing is for 1 battery pack.